Building gymnasts confidence with good progressions | | Swing Big! I am back to posting as usual. I hope everyone had a lovely Christmas and happy holidays. Today I’m going to talk a little bit about making kids feel safe. Besides using good progressions, this in my mind is one of the biggest keys to teaching skills. If your gymnasts feel safe the entire way, they’ll trust you, they’ll trust themselves and they’ll trust the process more. So I am going to show you a few set-ups that I like. This first one is a set-up for round-off back handsprings. There are a few things I really like about this: 1) They are round-offing off of an 8″, this allows them more time to get their chest up and their feet underneath them. 2) the number of 8″ers is great. When first learning back handsprings gymnasts often have a lot of different varying fears. While I prefer they learn their RO BHS on the floor first (before the tumble track) I’m not a fan of the harshness of the surface. This is a perfect compromise. This second set-up is also one a very much like. Keeping the shoulder angle open in the first part of the front giant is crucial. 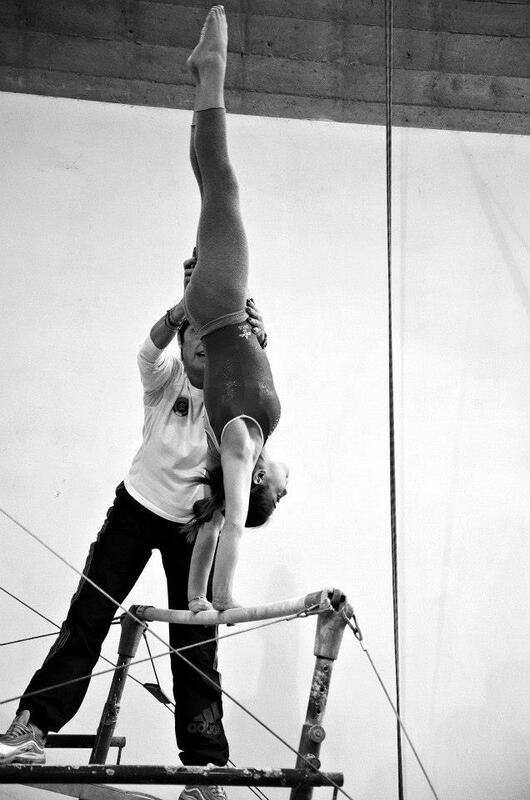 This way, gymnasts feel safe enough to learn how to do it, with no particularly bad consequences if things go wrong.